Holiday.gr - Agios loukas, a trip to a myth! Agios Loukas is in the region of Artemonas. It is small, graphic village with many churches built around the settlement. Its name is due to the homonym church. The village begins from the bridge of Gournia and strengthens north to the square of Artemonas. The glorious view to the Castle, neighborhood Kamaroti and the sea, enchants every visitor. It is worth visiting the churches of Panagia in Gournia (this location owes its name to the many small basins in the region), of Saint Nikolaos with the remarkable frescoes, of Saint George with the byzantine icons and of Saint Constantine with the special architecture. In Agios Loukas you can find a hotel and rooms to let, providing comfort staying. From the village begins the path and the road to the beach Poulati, with the abrupt rocks and wild beauty. It is ideal for daring swimmers! 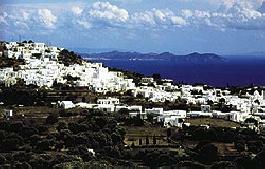 In Agios Loukas you can find a hotel and rooms to let, providing comfort staying. Been to Agios loukas ? Share your experiences!